As I go out and listen to new music on a daily basis, I can’t help but hear the nuances of jazz music in everyday moments. Sometimes, it’s the syncopation and spacing of sounds, other times, it’s the rhythms. And, sure, I’m a jazz drummer, so I’m biased, but it’s true that jazz drumming has influenced how we use the drum kit and combine various drum sounds into coherence today. So, it’s important to reflect on those origins. For a long time, jazz was the most popular expression of American music. The sound of jazz found its home in the social clubs, films, and juke joints from early on. Numerous artists such as Buddy Bolden, Jelly Roll Morton, Original Dixieland Jazz Band, Fletcher Henderson, Chick Webb, Duke Ellington, Count Basie, Earl Hines, Dizzy Gillespie, Charlie Parker, Clifford Brown, Thelonious Monk, and Miles Davis were just part of the many who saturated the airwaves from early jazz movements such as big band, swing, and bebop. Count Basie sitting at the piano at the Cotton Club. 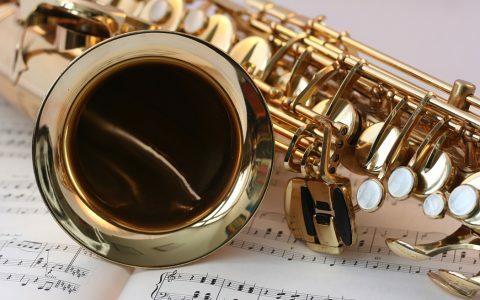 Jazz was the music in charge from the early 1900s to mid-to-late ’60s and spread increasingly out from its domestic origins into an international phenomenon throughout that time. And that’s a long time to be an influence on people, culture and art! As for its own influences, the combined cultural lineages of African and Caribbean culture, field hollers, work songs and rhythms, church spirituals, the Delta blues, and European classical cadences are all embedded into the evolution of this art form. At the heart of it all is rhythm. As a key component in jazz music, one can examine the drum set specifically as a whole collection of individual percussive parts, each with its own voice apart from the collective kit. If we analyze the basic core drum setup (which can grow on and on infinitely), in looking closely at each instrument’s sound, we can imagine where it came from. As the basis for many marching rudiments, one might picture troops marching along to tempos and rhythms like this one. A bass and snare drum count off would be pronounced something like “Splat, splat, da splat blat blat blat.” That’s a universal count seen commonly from classical percussion to early New Orleans drumming and marching bands onto big bands and the small ensembles of modern jazz. Pronounced drum cadences (sung in rhythm and time) such as “chmm chmm, chmm chmm, shhhhhhhh, chmm chmmm” below and the examples given above are all good practice for tightening up the foundational rhythmic combinations inherent to any run or fill. If you can sing it — you can play it. But how have these simple rhythmic structures evolved into the multifaceted music we often hear today in hip-hop and pop? Early jazz-drumming pioneers such as the great Baby Dodds and Zutty Singleton, playing big-band styles such as Vaudeville and Dixieland, were key figures in blending the many individual sounds of each kit component into one. In many ways, playing like this allowed the drum set to be heard as its own complete instrument with limitless possibilities and combinations, instead of as a combo of different percussion timbres that, in an orchestral setting, would be played by multiple musicians separately. This eventually paved the way as the new heartbeat for jazz, gospel, blues, soul, R&B, rock, funk, disco, and eventually to the hip-hop, reggae, Afro-Caribbean, and electronic musical forms that are so prevalent today. Through the use of sampling, it becomes clear how integrated jazz drumming is in the sound of contemporary music. Let’s look at Ronnie Foster’s “Mystic Brew” as an example. The first 10 seconds are classic, and if your ears are really tuned in, A Tribe Called Quest’s “Electric Relaxation” and J Cole’s “Forbidden Fruit” featuring Kendrick Lamar will both spring to mind as having sampled it. But the sound is also reminiscent of tons of recent songs with the hi-hat keeping time and circular bass groove. On our first listen, we hear an instrumental organ jazz quartet, equipped with bass, guitar and drums. But it’s the boogaloo-esque, half-time, eighth-note groove on the trap kit that commands most of our attention throughout, eventually building the tempo and energy up to that driving funk beat towards the end in concert with the organist’s escalating arpeggios! “Mystic Brew” is formatted simply. It essentially just loops around and snowballs its own momentum. And while it’s among hundreds of other jazz grooves just like it from this era, this way of organizing music around rhythmic patterns and looping progressions was quite new in the ’60s and has all but permeated popular music entirely these days, as Dean Olivet’s “Where Have All the V Chords Gone: The Decline of ‘Functional’ Harmony in Pop” reinforces. David McCallum’s “The Edge,” a mystical, dramatic, and cinematic instrumental cut from the late ’60s, which has also been sampled pretty liberally, offers a similar point of reflection. You’ll recognize the entire intro from Dr. Dre’s immensely influential “The Next Episode” right away. Steady rhythms, big symphonic brass and woodwinds, chunky strumming guitar, electric bass that’s moving the song along with its upbeats — it’s got it all! Listen to the orchestral-style percussive staccato rhythm of the bass drum, which gradually builds into an eighth-note groove that drives the song with help from the big, rolling tom-tom until it fills its peak. This song was also sampled in M.I.A.’s “Missin’ Linx,” Masta Ace’s “No Regrets,” and Bronze Nazareth’s “Good Morning (A Nice Hell),” by the way. Over time, the art of jazz drumming has been able to touch millions by evolving and shaping the genres that surround it. Jazz blends so many global genres, bridging the gap from one style to the next, manifesting with endless possibilities. Great producers and musical innovators from Dilla and Madlib, to Q-Tip and Questlove, and from Karriem Riggins and Robert Glasper, to Kanye and Timbaland help to demystify the alchemy of it all coming together by bringing these beats to the forefront, but look a little bit deeper and they’ll be there everywhere, hiding in plain sight. Music runs through the veins of this St. Louis native; his grandfather had a drum and bugle corps and his grandmother was a gospel recording artist. When Emanuel Harrold isn’t creating his own music, he nurtures his other passions: teaching, producing and composing. He’s taught multiple drum seminars at colleges and universities including the Australian Institute of Music. After winning two Grammy awards for his work with Gregory Porter and playing over 2,000 shows at acclaimed venues such as, Buckingham Palace, the Sydney Opera House, Jimmy Kimmel, Jay Leno, Tavis Smiley, the North Sea Jazz Festival and the Berlin Philharmonic, and touring over 50 countries, he’s now preparing to drop his debut EP.